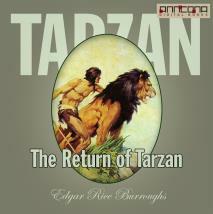 The Return of Tarzan is a novel written by Edgar Rice Burroughs, the second in his series of books about the title character Tarzan. The Return of Tarzan was the basis of two movies, the silent films The Revenge of Tarzan (1920) and The Adventures of Tarzan (1921), based on the first and second parts of the book, respectively. The first film starred Gene Pollar as the ape man, and the second Elmo Lincoln, the original movie Tarzan. Tarzan is a fictional character, an archetypal feral child raised in the African jungles by the Mangani "great apes"; he later experiences civilization only to largely reject it and return to the wild as a heroic adventurer. Created by Edgar Rice Burroughs, Tarzan first appeared in the novel Tarzan of the Apes (magazine publication 1912, book publication 1914), and then in twenty-five sequels, three authorized books by other authors, and innumerable works in other media, authorized and not. Tarzan is the son of a British lord and lady who were marooned on the Atlantic coast of Africa by mutineers. When Tarzan was only an infant, his mother died of natural causes and his father was killed by Kerchak, leader of the ape tribe by whom Tarzan was adopted. Tarzan is his ape name; his real English name is John Clayton, Earl Greystoke. Tarzan has been called one of the best-known literary characters in the world. In addition to more than two dozen books by Burroughs and a handful more by authors with the blessing of Burroughs' estate, the character has appeared in films, radio, television, comic strips, and comic books. The Return of Tarzan was first published in the pulp magazine New Story Magazine in the issues for June through December 1913; the first book edition was published in 1915 by A. C. McClurg. Edgar Rice Burroughs (1875-1950) was an American author, best known for his creation of the jungle hero Tarzan and the heroic Mars adventurer John Carter, although he produced works in many genres.